dwt2 computes the single-level 2-D wavelet decomposition. Compare dwt2 with wavedec2 which may be more useful for your application. The decomposition is done with respect to either a particular wavelet (see wfilters for more information) or particular wavelet decomposition filters. [cA,cH,cV,cD] = dwt2(X,wname) computes the single-level 2-D discrete wavelet transform (DWT) of the input data X using the wname wavelet. dwt2 returns the approximation coefficients matrix cA and detail coefficients matrices cH, cV, and cD (horizontal, vertical, and diagonal, respectively). [cA,cH,cV,cD] = dwt2(X,LoD,HiD) computes the single-level 2-D DWT using the wavelet decomposition lowpass filter LoD and highpass filter HiD. The decomposition filters must have the same length. [cA,cH,cV,cD] = dwt2(___,'mode',extmode) computes the single-level 2-D DWT with the extension mode extmode. Include this argument after all other arguments. Load and display an image. Obtain the single-level 2-D discrete wavelet transform of the image using the order 4 symlet and periodic extension. Display the vertical detail coefficients and the approximation coefficients. 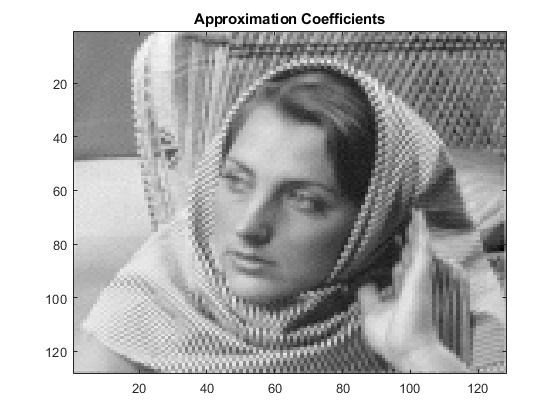 Generate the lowpass and highpass decomposition filters for the Haar wavelet. Use the filters to perform a single-level 2-D wavelet decomposition. Use half-point symmetric extension. Display the approximation and detail coefficients. Input data, specified as an m-by-n matrix representing an indexed image or an m-by-n-by-3 array representing a truecolor image. 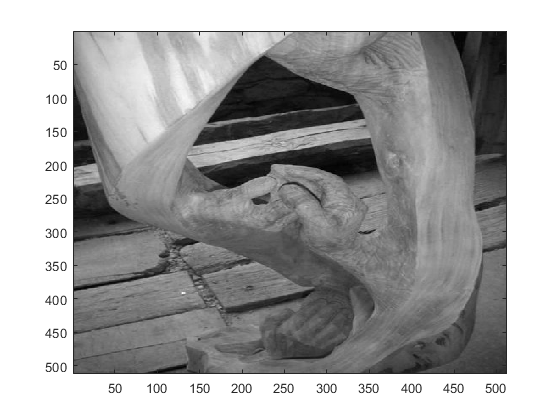 For more information on truecolor images, see RGB (Truecolor) Images (MATLAB). Analyzing wavelet used to compute the 2-D DWT, specified as a character vector or string scalar. The analyzing wavelet is from one of the following wavelet families: Daubechies, Coiflets, Symlets, Fejér-Korovkin, Discrete Meyer, Biorthogonal, and Reverse Biorthogonal. See wfilters for the wavelets available in each family. Wavelet decomposition lowpass filter, specified as an even-length real-valued vector. LoD must be of the same length as HiD. 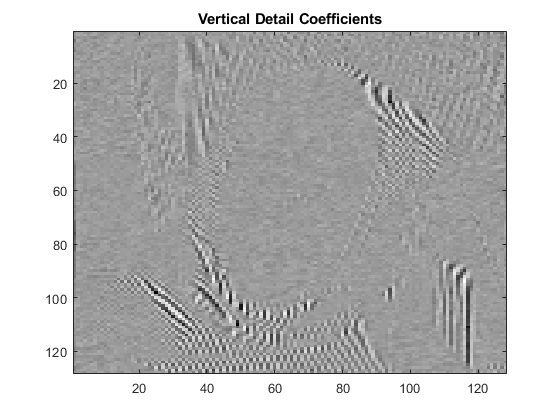 Wavelet decomposition highpass filter, specified as an even-length real-valued vector. HiD must be of the same length as LoD. If the signal length is odd, wextend adds to the right an extra sample that is equal to the last value, and performs the extension using the 'ppd' mode. Otherwise, 'per' reduces to 'ppd'. This rule also applies to images. The global variable managed by dwtmode specifies the default extension mode. Approximation coefficients, returned as an array whose size depends on X. Let sx = size(X) and lf = the length of the decomposition filters. If the DWT extension mode is set to periodization, then this output is of size ceil(sx/2). For the other extension modes, this output is of size floor((sx+lf-1)/2). Horizontal detail coefficients, returned as an array whose size depends on X. Let sx = size(X) and lf = the length of the decomposition filters. Vertical detail coefficients, returned as an array whose size depends on X. Let sx = size(X) and lf = the length of the decomposition filters. Diagonal detail coefficients, returned as an array whose size depends on X. Let sx = size(X) and lf = the length of the decomposition filters. 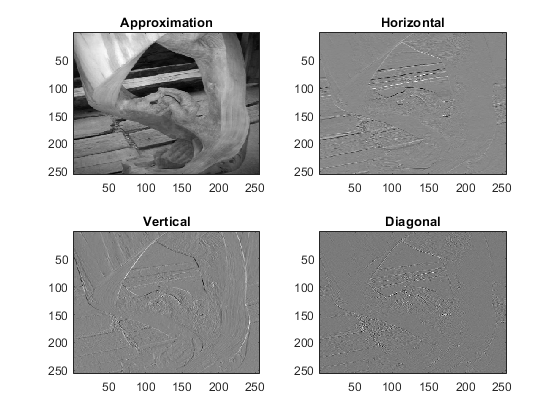 The 2-D wavelet decomposition algorithm for images is similar to the one-dimensional case. The two-dimensional wavelet and scaling functions are obtained by taking the tensor products of the one-dimensional wavelet and scaling functions. This kind of two-dimensional DWT leads to a decomposition of approximation coefficients at level j in four components: the approximation at level j + 1, and the details in three orientations (horizontal, vertical, and diagonal). The following chart describes the basic decomposition steps for images. The decomposition is initialized by setting the approximation coefficients equal to the image s: CA0=s. To deal with signal-end effects introduced by a convolution-based algorithm, the 1-D and 2-D DWT use a global variable managed by dwtmode. This variable defines the kind of signal extension mode used. The possible options include zero-padding and symmetric extension, which is the default mode. Daubechies, I. Ten Lectures on Wavelets, CBMS-NSF Regional Conference Series in Applied Mathematics. Philadelphia, PA: SIAM Ed, 1992. Mallat, S. G. “A Theory for Multiresolution Signal Decomposition: The Wavelet Representation,” IEEE Transactions on Pattern Analysis and Machine Intelligence. Vol. 11, Issue 7, July 1989, pp. 674–693. Meyer, Y. Wavelets and Operators. Translated by D. H. Salinger. Cambridge, UK: Cambridge University Press, 1995.